Veterinary drugs are widely used in the food industry to treat and prevent diseases in animals, and can also be used in excess due to their growth promoting effects. With the increasing use of these substances, large amounts of residual veterinary drugs may persist in food products and raise major concerns to public health. Hence, maximum residue level (MRL) of veterinary drugs have been placed by government bodies and constant surveillance is required. 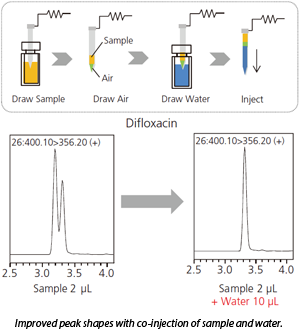 LC-MS/MS is commonly used in quantitation of drug residues. However, operators are often challenged with large number of samples that requires laborious and time-consuming sample preparations method. 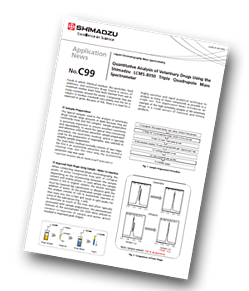 Here a single-step QuEChERS sample preparation method is described that reduces sample preparation time by avoiding the conventional SPE procedure. Using the SIL-30A autosampler, improved peak shapes were achieved by the co-injection of sample and water. 89 veterinary drugs were quantified in pork extract spiked with standard solution and limits of quantitation ranging from 0.01 – 1 µg/L were demonstrated, except for florfenicol (10 µg/L). Matrix effect was assessed with various food products, demonstrating rates of recovery of 70 – 120%. Furthermore, excellent robustness was achieved with the highly stable data measured continuously over a period of 3 days.